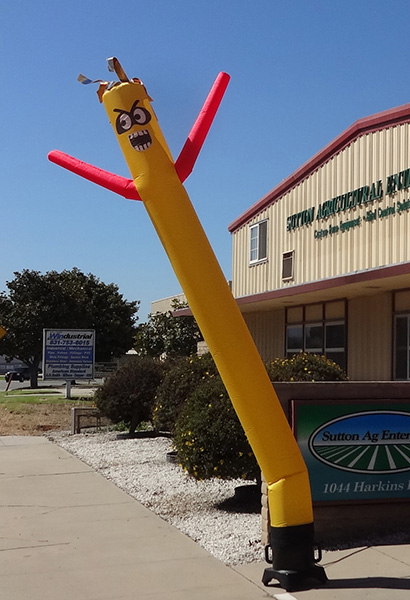 Scare pesky birds and unwanted pests away from your crops with AirRanger® scarecrows (air dancer). The AirRanger® air dancing scarecrow is the safe, easy, and affordable addition to your pest bird control program. 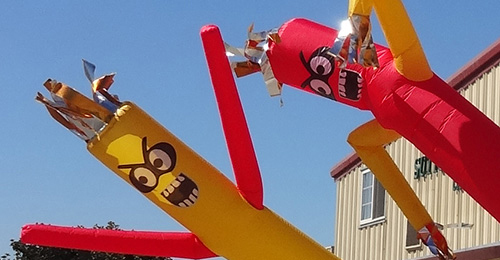 This patent pending air dancer is proven to reduce bird damage to your fruit, vegetables and seed. Reduce crop loss due to pest birds and wildlife. The constant dancing motion scares birds away time after time. A modern reworking of the time tested scarecrow, the world's oldest bird control device - the AirRanger® is a bird deterrent that works! 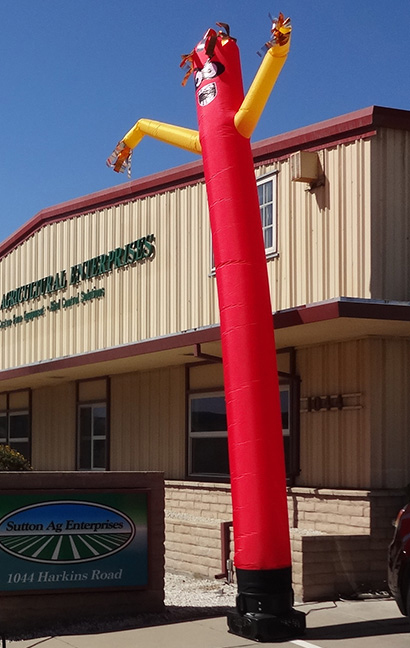 The AirRanger® scarecrow is inflated by an attachable blower fan (requires electrical power). Constant airflow keeps the AirRanger® air dancer bending and dancing, flapping its arms to ward off pest birds and wildlife. Reflective silver and gold colored hair shimmers and flashes in the sunlight, adding to the AirRangers effectiveness. Color: Yellow body, red arms, and reflective hair-strips. Scary face on front and back sides. Material: High strength polyamide nylon silk w/ added tarpaulin, bottom is constructed with 600D pvc/nylon. 12' AirRanger scarecrow is NOT intended for use in prolonged exposure to direct rain. This product is built to withstand the elements, however it is an electronic product and reasonable precautions must be taken. Damage due to water over-exposure voids warranty. A Yellow Replacement Sleeve for your existing 12' tall Air Ranger scarecrow is now available. For use with 12-inch diameter AirRanger small blower. Includes canvas storage bag with velcro closure. 20' Model includes wheels for easy repositioning in the field. Material: High strength polyamide nylon (non-rip) silk w/ special additives. 20 AirRanger scarecrow is NOT intended for use in direct rain. Product is made for outdoor use but needs protection from rain. It is an electronic product and reasonable precautions must be taken. Damage due to water exposure voids warranty. A Red Replacement Sleeve for your existing 20' tall Air Ranger scarecrow is now available. For use with 18-inch diameter AirRanger large blower. Includes canvas storage bag with velcro closure. Either Air Ranger fan requires AC power, or a generator. Propane powered generators (e.g. Sportsman Propane 1,350/2,000-Watt Portable Generator) are generally more efficient than gas powered. 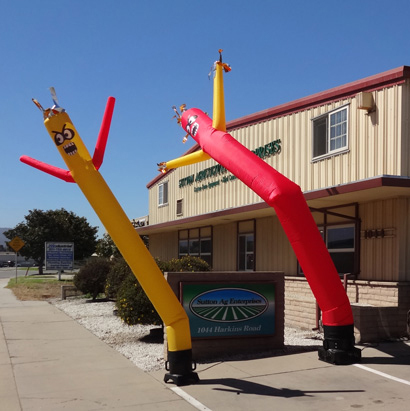 Air Ranger air dancing scarecrows, from Sutton Ag, your friendly source for precision farm equipment. U.S. exclusive distributor of Zink-Feuerwerk bird control pyrotechnics, Zon propane cannons, Ortomec harvesters, Steketee weeding equipment, and Clean Seeder planters.